After all the work done on determining adjectives in this unit, you and your class deserve a break! This last lesson in the unit is the simplest lesson of all and will have your students participating in interactive games to promote learning! Students will understand and be able to use exclamatory determining adjectives. 2. Review demonstrative adjectives, possessive adjectives, numeral adjectives, indefinite adjectives, and interrogative adjectives to ensure retention. 3. Introduce the concept of exclamatory determining adjectives and give examples in English. 4. Get out the organizational sheet and have students fill out the exclamatory adjectives section, creating examples as you work through the concept. 5. Have students say an encouraging exclamatory term about another student in the class (i.e. ¡Qué belleza¡ or ¡Qué talentoso! etc.). 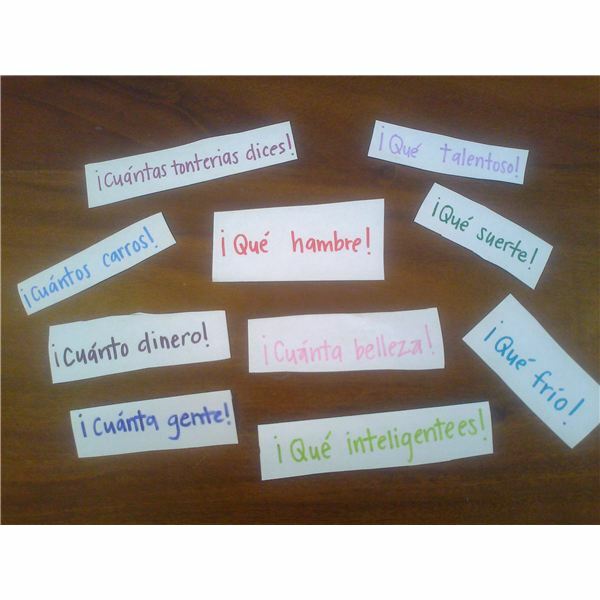 Then go around the class having students create exclamatory sentence about the classroom or the world around them using “Cuánto/a" and “Cuántos/as." 6. Play exclamatory charades. Give students a small slip of paper and have them write on exclamatory adjective phrase on their piece of paper. Mix up the papers and put them into a hat. Have students act out or draw out what the phrase is saying. The team with the most points is the winning team. This lesson is much lighter than the other lessons contained within the unit. Assess student progress on this lesson alone by listening as they come up with exclamatory phrases. A comprehension quiz or test at the end of this unit will be necessary to gauge student learning.